JOHN SILK, Minister for Foreign Affairs of the Marshall Islands, reminded the Assembly that the United Nations had a clear responsibility to acknowledge and address the consequences of nuclear testing undertaken during its watch in his country. Three weeks ago, the leaders of the Pacific Islands Forum, in their communiqué, had recognized not only the special responsibility by the United States, but also agreed to support the Marshall Islands at the United Nations, including in addressing the Secretary-General’s report on the effects of atomic radiation in the country. 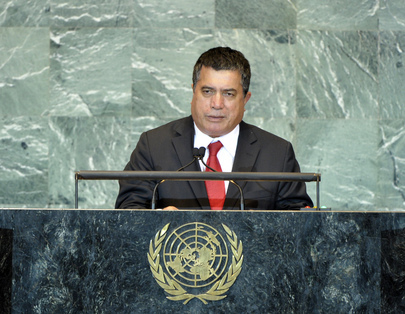 That report, requested by the General Assembly in 2010, represented the potential for the Marshall Islands, the United States and the United Nations to take a very positive step forward in understanding the country’s past, bringing closure to what he described as a “sad chapter in our history”, and understand how the international community could assist in addressing future remediation challenges. He believed United Nations involvement in all those efforts was key. Sadly however, he said, he was concerned that the Secretary-General had, thus far, “neglected this critical opportunity”. The United Nations Scientific Committee on Effect of Atomic Radiation, which was invited to contribute to the Secretary-General’s efforts to assemble that report, had termed the General Assembly’s deliberate mandate to be “not appropriate” and “an apparent error in need of formal correction”. This was not only insensitive, but revealed that perhaps the United Nations itself had yet to come to terms, or even to merely acknowledge, its decision on nuclear safety taken 60 years ago. In his view, that negative approach could preclude efforts to bring to the attention of the General Assembly important scientific work that had been done in assessing the consequences of the nuclear testing in the Marshall Islands. He said he hoped that the United Nations would have the courage and will to rise above the past and make a difference, rather than to allow itself to remain controlled by history, and make excuses. Nuclear testing impacts were not the only historical legacy from international actors in the Marshall Islands — unexploded ordnance from the Second World War and oil leakage was a persistent issue with the outer island communities and posed threats to human security, public health and environmental safety. The country, therefore, welcomed the attention of the Pacific Islands Forum leaders and joined the call for assistance from international bodies and development partners. Turning his attention to climate change, he said international climate negotiations were at risk of entering a phase of political stalemate, noting that those negotiations had spent over two decades in a complicated process that had delivered very little in terms of practical action to mitigate the climate change problem. Often blocked by only a handful of countries, the international community was still unable to commit to emission cuts and targets sufficient to ensure the survival of the Marshall Islands and other low-lying nations. Declaring that his country could wait no longer, he asserted that the Marshall Islands was now choosing creative paths to drive urgency into the broken negotiations and pursue practical initiatives to address the threats and risk. First, the country had joined with Mexico in urging the United Nations Framework Convention on Climate Change to consider the use of voting as a means of last resort. Second, it had also joined with its Pacific Small Islands Developing States colleagues in July to push for the Security Council to recognize that climate change now posed an incontrovertible threat to international peace and security, he said. Third, his country was studying carefully options for clarifying the relevant international obligations related to climate change and how those affected its statehood. “We, the most vulnerable, must act when others lack the political will,” he added.